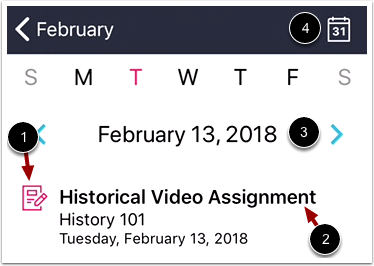 You can view up to 10 calendars from your courses in the app. 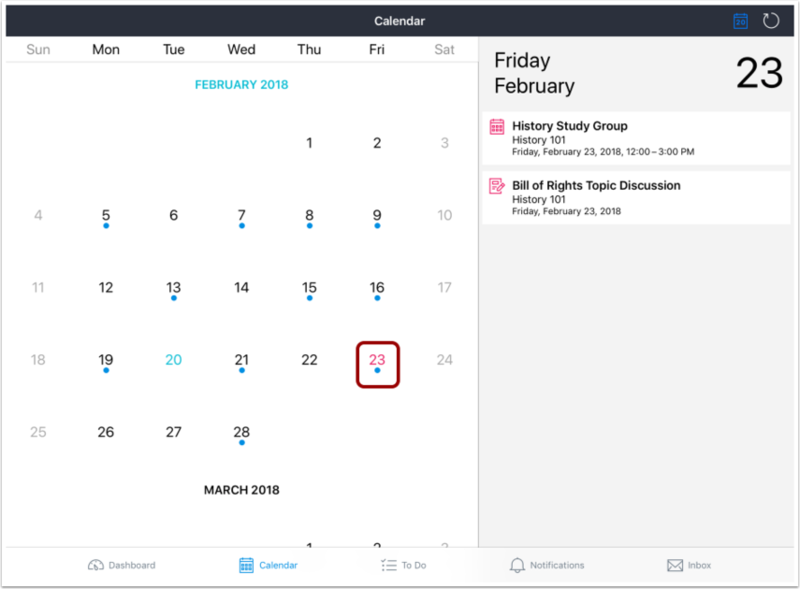 If you want to view Canvas events in the native iOS calendar, you can also subscribe to the Canvas calendar feed and view Canvas events along with your personal calendars. Students cannot sign up for Scheduler appointments or create events in the app. On the Dashboard, tap the Calendar icon. The calendar displays an overview of the current month for favorited courses. The current day of the month is highlighted in blue text . 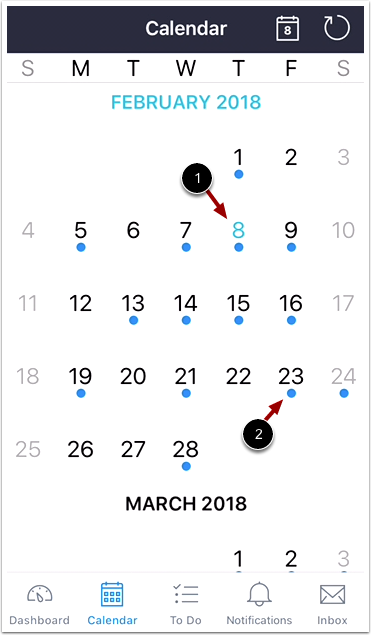 The calendar displays a blue dot for any dates that contain an assignment or event . For an overview of another month, swipe the calendar up or down. To return to the current month view, tap the Calendar icon . To refresh the calendar, click the Refresh icon . 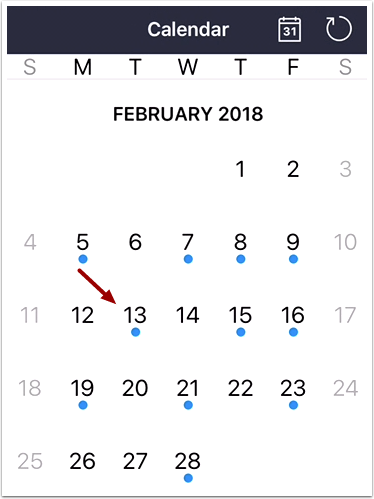 To display calendar events for a specific date, click a date in the month view. 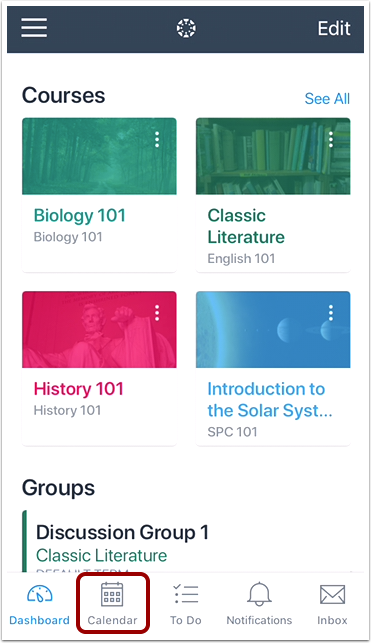 The daily list view shows the assignment type  and the name of the assignment or event . For an overview of another day, use the date arrows  or swipe the calendar to the left or right. To return to the current day, tap the Calendar icon . In tablet devices, the Calendar supports landscape mode, which allows you to view the monthly calendar and the daily calendar concurrently. When viewing in landscape mode, the date being viewed in the monthly calendar is highlighted in red. Previous Topic:What Student app options can I manage from my iOS device settings? Next Topic:How do I subscribe to the Canvas calendar on my iOS device? Table of Contents > App Features > How do I view the Calendar in the Student app on my iOS device?